American YouTuber Coby Cotton has a blissful married life behind the cameras. And Coby timely updates his social media sharing pictured with the love of his life. The Texas native famously rose to fame for being a member of the popular YouTube group Dude Perfect, a sports and comedy entertainment brand that specializes in trick shots and comedy. Their YouTube channel has garnered more than 31 million subscribers to date, and their video is speculated to have more than 10 million views each. Importantly, the show started airing as a television series via the CMT network in 2016 as well. Coby, who ages 30 as per his birth date: 17 July 1987, has got a prospering career. 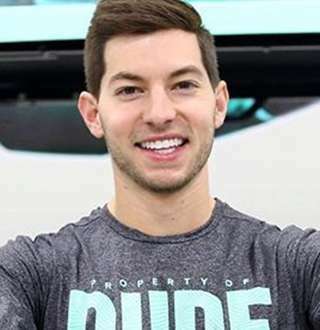 He initiated his career as a YouTuber back in June 2009 after making the channel, Dude Perfect with collaboration with his twin brother, Cory, and their friends Cody Jones, Tyler Toney and Garrett Hilbert. When the channel was first made, Coby was still in his junior year at Texas A&M University. He along with his team started posting videos that focused on trick shots. They practiced hard to get the wanted results, and with such determination, their video started becoming viral. The first video of Coby's group to grab huge attention was titled as Worlds Longest Basketball Shot and posted on 17 September 2009. Since then, the fame of Coby and undoubtedly his team has been soaring high. The group 'Dude Perfect' has the largest following for a US channel garnering over 34 million subscribers. The adjudicator, Michael Empric announced that Coby had to blow the pea to a distance of 24 ft 7.6 inches in a single breath which he completed quite hardly. Whatever might be the case, he holds the title for the 'Farthest distance to blow a pea' with the distance of 8.8 meters. With such fame and success, the group is estimated to have a net worth of $20 million. However, the individual net worth of Coby remains confined. Coby is blissfully married to his wife, Aubrey Cotton. Though Coby has not spilled the beans on how he met his wife and how their love flourished, he introduced her to his followers via an Instagram post back on 14 May 2017. He posted a picture with Aubrey and captioned the picture writing, "I like her a lot." "Aubrey, you are a treasure and I love you so so much." The pair even went to events and spend quality time together. On 2 December 2017, the pair finally exchanged the wedding vows and got married. However, they kept the details of their wedding concealed, cautiously not flaunting their wedding moments on Instagram. Nevertheless, on 3 January 2018, Coby Instagrammed a wedding picture where he and Aubrey looked stunning on their wedding dresses. Via the caption, he commemorated the year 2017 and disclosed that marrying Aubrey was the god's greatest gift of the year. Likewise, he even shared a picture of his wife with a luggage beside her via Instagram on 3 March 2018. This hinted that the couple was on a vacation, most probably their first ever honeymoon together. With love and budding married bliss, Coby awing his fans both personally and even professionally: all thanks to his perfect trick shots. Louie Anderson Scandal Made Gay! Once Married Man With Wife Now Queer? Sara Martins Partner | 'Death in Paradise' Actress Dating To Get Married Now?